Born and raised in Liverpool, she worked in clerical jobs in various parts of the UK until moving to Scotland in 2011 with her husband’s job. Rosemary now lives and works in the Clyde Valley area of Scotland. Deciding to push the keyboard away and dust off her brushes, she started painting again which has always been a passion of hers, but one she never seemed to have enough time to do. 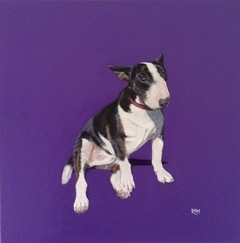 Rosemary is completely self-taught with a love of art and animals which are now combined in her animal portraits. After being asked by friends and family for portraits of their pets and children, she quickly decided to concentrate on painting as a new career path and became self-employed in 2012, working as Rosie Mark Artwork. Rosemary started displaying her work in a local retail outlet which helped get her established. When she’s out and about, she often asks pet owners if she can take a few reference shots of their dogs and they are always more than willing to get their furry models to strike a pose. Rosemary also has a fondness for painting cows, which Scotland has a plentiful supply of. Using acrylics, oils or pastels, her style is contemporary using a solid colour background in order to focus on the subject in the painting. Rosemary loves to capture the character and expression in her animals – it’s always there, in the eyes – whether it’s a cat, dog, cow, chimpanzee or even a chicken!